The Achenbach syndrome is an abnormal condition of hand or fingers in which spontaneous paroxysmal bleeding occurs on the subcutaneous layer of hand or fingers. This condition is self-limiting and can resolve on its own in its mild condition within few days. 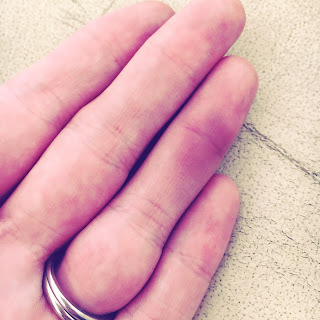 This condition can appear on any finger. In this condition the fingers get swell and the patient feels burning pain sensation on the tip of fingers along with itching. These symptoms appear right after the onset of Achenbach syndrome. These symptoms should be diagnosed on time otherwise it can lead to other serious vascular diseases. The Achenbach syndrome might affect the mobility of the finger and hand. 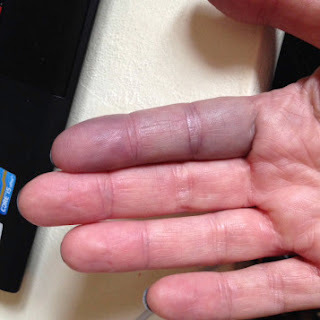 The color of the finger or hand affected by Achenbach syndrome turns blue or pale in color and get cold. It is a benign condition. Women are more susceptible to Achenbach syndrome as compare to men. The investigations shows that women above 50 years of age are more susceptible. The most commonly effected fingers are middle and index finger. This condition may be a result of less or blocked blood flow to the digits of the fingers or hand. This syndrome is related to vascular system of body because it is a vasospastic reaction. Affected fingers or thumb get swollen. Color of the volar aspect of finger becomes bluish or pale as a result of improper blood flow towards digits of fingers. The fingers can’t move. Patient feels itching and sometimes gets scratches on finger while rubbing it. Patient also feels sudden and pinching pain on the valor aspect of fingers. Paroxysmal hematoma occurs on the valor aspect of fingers and hand. Most commonly involved fingers are the index finger and the middle finger. The decrease in blood flow towards the digits of the fingers due to any obstruction in arteries may lead to Achenbach syndrome. This condition is diagnosed via arteriography. It may be secondary to the use of medications like the medications of migraine i.e. ergotamine. This medicine effect the micro vascular flow towards the digits of fingers resulting in vasospastic reaction. Trauma is also a reason behind this syndrome. The Achenbach syndrome is a self-limiting condition which recovers on its own within few days. The syndrome appears again and again and after few days it disappears on its own. The treatment is all dependent on the diagnosis. If there is clotting of blood in arteries, then anti-coagulants are prescribed to regulate the blood flow. If there is any obstruction in the blood flow due to trauma, then a proper surgery is performed to clear the obstruction. The medicines responsible for causing Achenbach syndrome are reduced in dose or quit along with complete monitoring is required.